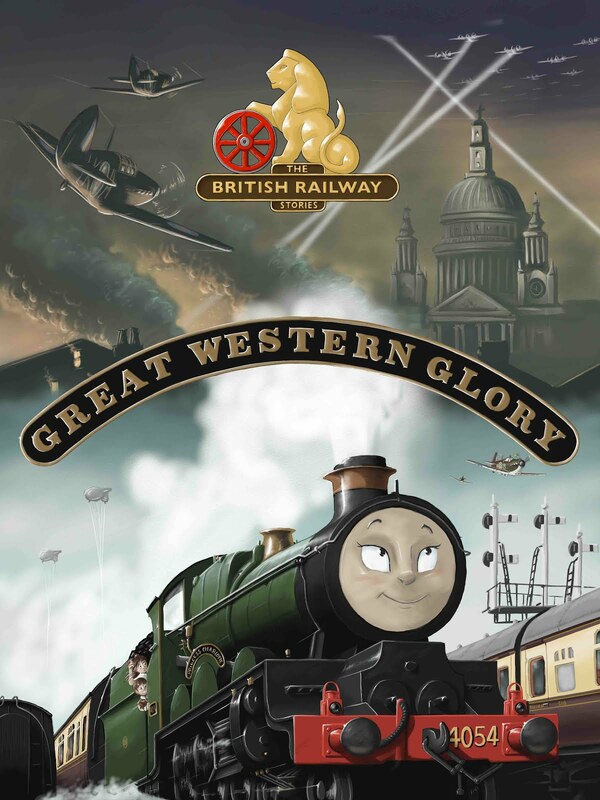 THE BRITISH RAILWAY STORIES LTD: "Thompson B3/3: a tonic for insomnia"
It's amazing sometimes how quickly things seem to go together when it's half two in the morning. I had another batch of insomnia last night, something which affects me particularly when I am stressed. I cannot switch off. The brain will not be told to go to sleep. It continues unabated, incessantly repeating the worries until I nod off through lack of sleep around 4am before having to get up at 8.30am to go through my usual writing routine, along with job applications, orders for the book and more planning and writing of future books and videos. So in order to take my mind off things (job prospects, the book being published, sister heading off to Madrid to be in a play, paying for car repairs, girlfriend's teaching career troubles) and all the other little things at present, I decided to get my Isinglass drawings out and see what more could be done to my Thompson B3/3 model. This was just after midnight last night, and I didn't stop until it was actually half two in the morning. I bought a spare Thompson B1 bogie off eBay last week. 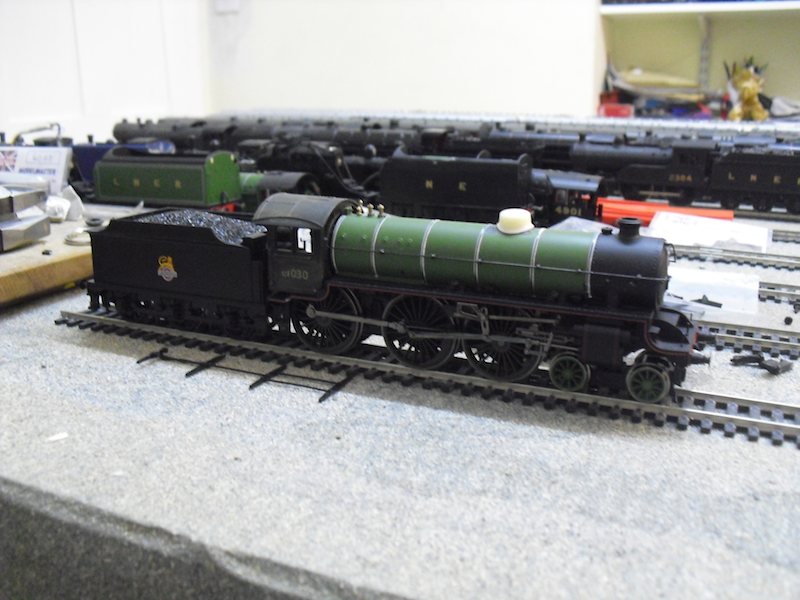 This bogie has actually come off the latest Hornby Railroad Flying Scotsman model, which for some reason doesn't use the correct type but re-uses that on their B1 model. 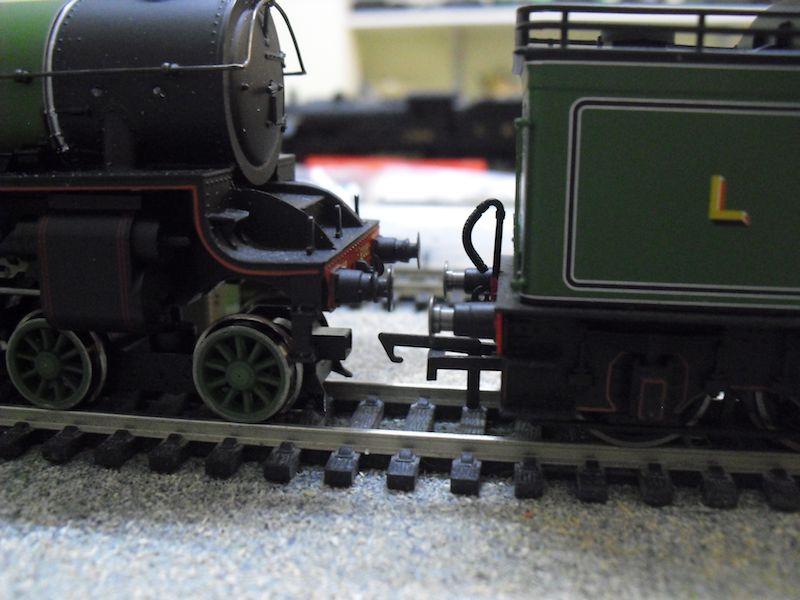 This suited me as the spare B1 chassis I bought did not originally come with a bogie. In a similar vein to the changes I made to 60113 Great Northern's bogie recently, I will chop off and file down the obtrusive NEM pocket when I get a chance. You will notice the difference in buffer heights. This is the next stage of the build which I have to work through. The B3/3 had the B1 boiler pitched higher than the B1, which necessitated deeper "shoulders" over the cylinders. It also had deeper and longer cab sides to compensate, which I will tackle at the same time. 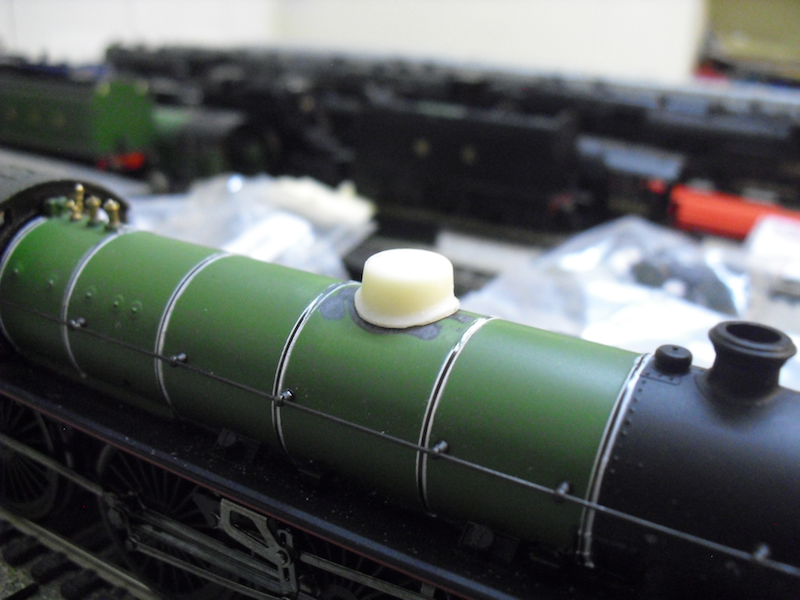 The next step was to cut off the existing moulded dome from the Bachmann B1 body shell, filing the boiler smooth afterwards. This is so I can fit one of Graeme King's excellent Gorton style domes instead, which the B3/3 was fitted with (being rebuilt in real life at Gorton). You will notice I've cut and moved the rear steps and running plate away to show where the cab needs to be modified along with the rear curve down. The cab side sheets need to be replaced, and luckily I have worked out a way of doing this so that the correct length and depth to the side sheets, along with the correct window placement can be done. The curve in the running plate will need to be cut and then extended to match. The rear splasher can be taken care off very easily by retaining the cutout in the existing cab. 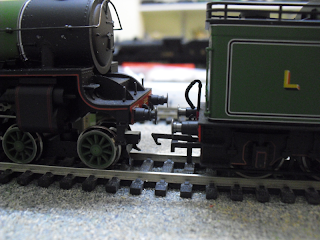 The difficult bit is adding the small splashers further up the running plate. Holes will be drilled to fit, and then splashers made in plasticard and fitted thereafter. 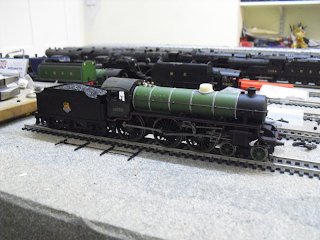 I'm planning, once the front running plate is cut and shut to the correct depth, and the spare Hornby B1 buffers have been added, to fit a set of false frames over the bogie wheels to give the model less daylight in that area, and preserve the bulky look further. The next stage is to finish the work on rewiring the model, and adding pickups to the tender to help with the running capabilities. 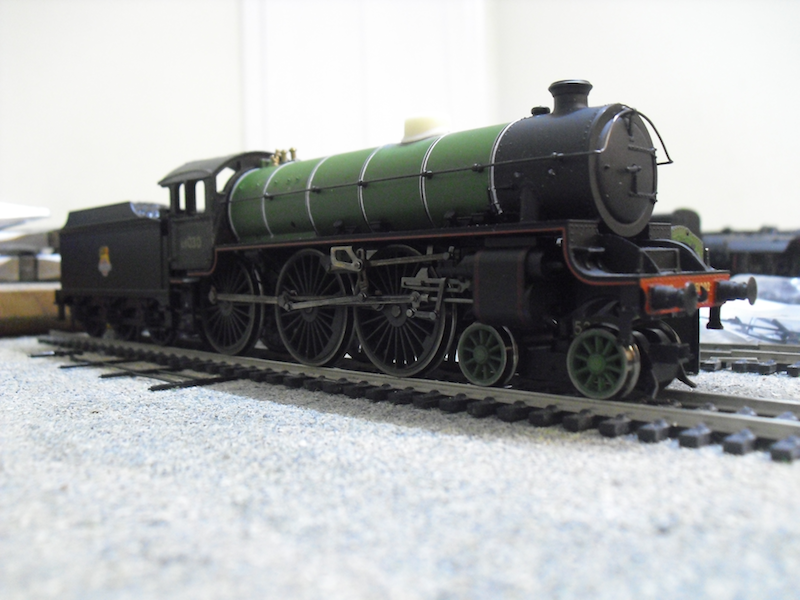 I've been astounded at how smooth the model is on the rolling road, particularly as no modifications have been made to the valve gear or the driving wheels to fit each other. It was a simple drop in replacement for the original B1 driving wheels. So there you have it. A few bits of cutting and shutting, dome replacement and the addition of a front bogie to push the Thompson B3/3 build a bit further on. It is proving to be the tonic to my sleep problems as I nodded off shortly afterwards, still at my workbench. I am glad I had put the scalpels away by then...!